I became a believer in elementary school, and at that early age I was very intimidated by anything that had multiple pages. So a book like the Bible, that weighed as much as a small human, was more like a decoration in my life than an intricate part of it. I was too ashamed to ask how to read the Bible, because I just thought people knew how to do that and I was the only one that didn't know. It was more than a decade into my relationship with Jesus before I had any guidance on how to read this book. I even led in ministry, yet never opened the word on a regular basis, because I had no clue what I was doing. Yikes, I so hate to admit that, but it is the truth! My Bible was people — and guess how well that worked out? Tons of confusing messages, and those messages changed everyday. Maybe you can relate. Maybe you are like me and the desire is there, but you have no clue where to start. Or maybe reading the word comes second nature to you, or maybe this will be more of a discipline for you before it gets to be a desire. Spending time in the Bible is a game changer, because it is one of the ways that God speaks to us. It’s how you get to know His character… who God really is, not our preconceived notions or the compiled voices of those around us. In reading the Word of God, you’ll learn the truth about who YOU are…you’ll see a love for you written in these pages that Nicholas Sparks cannot compete with. Yep, I said it. Wisdom…comfort…advice…commands…. the list is endless. Now, there are many methods you can use to spend time in the word and I’m only going to talk about one here. But please continue to have this conversation with your LifeGroup leaders and those discipling you. It is so worth it! One of the first methods I learned was called S.O.A.P. Which stands for scripture, observation, application and prayer. Scripture: Before you start reading, pray and thank God for what He has done and ask Him to bring his Word to life for you. After your prayer of thanks, read a portion of scripture, I recommend a “small bite” if you are new to the game. So, maybe a chapter or less depending how long it is. Then, write down or highlight the scriptures that jump out at you. Observation: Next to each scripture, write down what struck you about this verse. This can be one observation or an IKEA manual full. Application:How can I tangibly apply the above scripture(s) to my life? Take the time here to ask God to help you put the word into action. Sometimes we see the Bible as a good book of quotes, but it is a book that will radically change your life when you start purposefully living by what it says. I encourage you to apply things to your life in a real & active way. So, maybe instead of saying, “I need to be better at being nicer to my annoying co-worker,” you could instead write, “Whenever my co-worker annoys me, I’m going to ask God to show me something that He loves about them, and then I’m going to compliment them on that thing.” Put it into measurable action. Prayer: This is a prayer thanking God for how He spoke to you today and asking him to help you apply this part of the Bible to your life. At Antioch, we believe the Bible is living, breathing, always speaking and pivotal for our walk with Jesus. Whether spending time in the Word feels easy or like a stretch, we want to equip you to dive into the Word and making it a part of your daily life. I pray that this encourages you in your walk with Jesus! Praying Isaiah 26: 1-4 over you tonight as I finish writing this post. 1-6 At that time, this song will be sung in (UTAH) We have a strong city, Salvation City, built and fortified with salvation. Throw wide the gates so good and true people can enter. People with their minds set on you, you keep completely whole. Steady on their feet, because they keep at it and don’t quit. 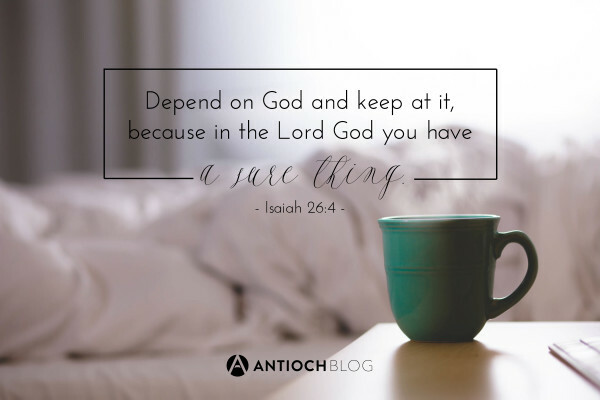 Depend on God and keep at it because in the Lord God you have a sure thing. Keep at it. Don’t quit. He’s a sure thing.